Get double the fun with the powerful new Monkey Spanker Double Trouble Masturbator, with FREE UK DELIVERY! The Monkey Spanker Double Trouble Masturbator is unique design in masturbators for men, based on the original paddle design but doubled up for twice the fun. The soft membrane of the Monkey Spanker opening slides down on your shaft and delivers an interesting and unique pleasure not found with any other toy. The stretchy silicone of the opening transfers the power of the included vibrating bullets to caress and tingle your shaft, giving you direct pleasure right where you want it. The double ring of soft silicone stretches to slide up and down the shaft like thin and stretchy doughnut, while the vibrating action from the bullets adds the secondary pleasure to your masturbation. 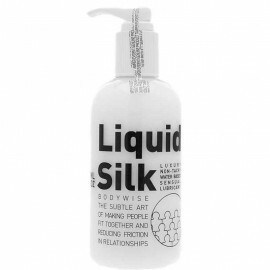 We would recommend a good water based lube with this item, and we'll even send you that free as an extra little gift. Free UK delivery is available on this item.